I enjoy reading Penny Watson's work, this book was no exception. I love her voice and her story telling. Her characters quirks are what add richness and depth to her stories. 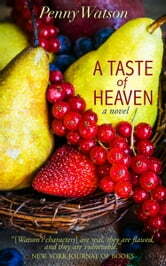 In "A taste of heaven" her heroine and hero take chances and come out stronger together. The banter is delicious and wicked, the romance is sweet and as a farmer's daughter and an agvocate I love how she subtly wove the thread of from farm to table into the story. The one thing I would have liked was being able to read from Elliot's point of view - hence the four stars instead of five. Sadly it has not inspired me to try haggis, I'm chronically unadventurous when it comes to animal sources of protein, I am regretting that it came out in the fall when the fresh greens are done for the season. I will be rereading this in the spring to get inspiration for spring and summer salads.